University of Canterbury's Mt John Observatory at Lake Tekapo with Tekapo Tourism. 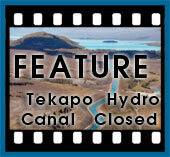 Tekapo Tourism has installed a webcam overlooking Lake Tekapo at Mount John. Click here to view the latest image from the camera. Both day and night tours of Mt John University Observatory are now available through Earth and Sky tours. See our activities page for contact information. This 1.8m telescope has recently been installed at Mt John and is an international partnership between astronomers at the universities of Canterbury, Auckland and Victoria in New Zealand, and Nagoya University in Japan. Lake Tekapo has one of the most spectacular night skies in the world. Visitors from all over New Zealand and the world are amazed by the clarity and sheer numbers of stars visible to the naked eye during Lake Tekapo's night. Lake Tekapo's night sky has interested more than just the visitors. 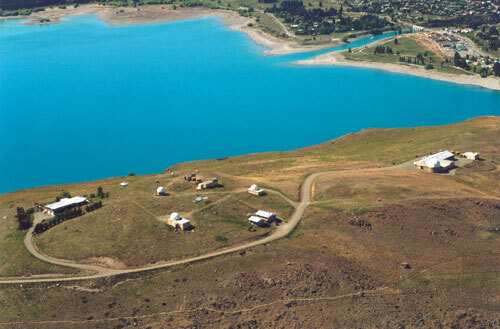 Canterbury University operates a astronomical observatory on top of Mt John, overlooking Lake Tekapo. The clear skies and low levels of local light pollution have helped astronomers put Mt John observatory on the international map with observations and discoveries of the southern sky. Just prior to this page going on-line, Mt John had played an major role in part of an international programme to detect and monitor collapsing stars. Over a month Mt John observatory detected and announced to the astronomical community, two exploding stars approximately 11.5 billion light years away. In other words, these massive stars exploded long before our planet even existed. Because the stars were so far away, the light and radiation emitted by the explosion has only just reached us now, 11.5 billion years later. There is daytime vehicle access to the summit of Mt John. A $5 road toll applies. This toll is to cover the high maintenance costs of the private road. 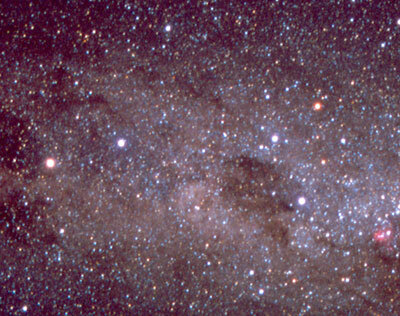 In 1960 the University of Pennsylvania received a grant from the U.S. National Science Foundation to survey New Zealand to find the best site for an astronomical observatory. Pennsylvania wanted to establish a southern station and New Zealand was much further south than the established observatories in Australia, South America and South Africa. So from here more of the southern sky was continuously visible throughout the year. Among the criteria for an observatory site were: a large number of clear nights, a dark sky not polluted by artificial light from any nearby town or city, a site reasonably close to power and water supplies and main roads and not too far from a major city. The site survey began in 1961. It was organized by Mr Frank Bateson, a New Zealand amateur astronomer internationally respected as the Director of the Variable Star Section of the Royal Astronomical Society of N.Z. From geographical and weather information Bateson selected potential sites in the Bay of Plenty, Nelson, Marlborough, the Mackenzie Country and Central Otago. Between 1961 and 1963, with much help from local authorities and individuals, various sites were occupied so sky conditions could be continuously monitored. By 1963 it was clear that Mt John provided the best conditions, all things considered. The University of Pennsylvania made an agreement with the University of Canterbury to jointly develop the site, thus providing a city base in Christchurch. The observatory was officially opened on 10 July 1965. The observatory's early instruments were astronomical cameras, provided by Pennsylvania, and telescopes lent by Bateson. They were housed in buildings largely constructed by volunteer labour from the South Canterbury district. In 1970 the 60cm (24inch) Optical Craftsmen (the 'OC') telescope was installed. Five years later a second 60cm telescope made by Boller and Chivens (the 'B&C') was erected. During these years some of the original University of Pennsylvania staff moved to the University of Florida so it too became part of the consortium. However, from about 1975 the contribution and interest of the U.S. partners waned as their senior staff retired. The Observatory now operates entirely as a field station of the University of Canterbury's Department of Physics and Astronomy. In 1969 the U.S. Air Force built a satellite tracking station on Mt John south of the university observatory. The USAF also funded the sealed road up the mountain and a water supply from Lake Tekapo. Prior to this the Observatory had depended on rainwater or tanker supplies brought up a rough track. The tracking station employed a large staff for following the positions of US and Soviet satellites. The USAF tracking station closed in 1982 as new imaging technology made it redundant and the building passed to the New Zealand government. Canterbury University now leases the building and has modified it, adding a large dome to the north end to house its one-metre telescope. The 'One Metre building', as it is generally called, accommodates visiting staff and observers. It also houses an upper atmosphere experiment that measures wind and air temperature 100 km above the ground, part of an international study. The One-Metre McLellan reflector was built in the University of Canterbury’s workshops and was installed at Mt John in February 1986. It is used for a wide variety of astronomical research, most of it in stellar astrophysics: the study of stars and their evolution. In 2001 a large ‘fibre fed’ spectrograph made at Canterbury was installed, greatly enhancing the telescope's capabilities. 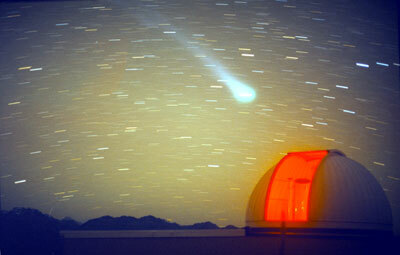 Since 1996 a consortium of New Zealand and Japanese researchers have run a joint programme on the B&C telescope. It is called the MOA project from Microlensing Observations in Astrophysics and involves Auckland, Massey, Victoria and Canterbury universities on the NZ side, and Nagoya University in Japan. 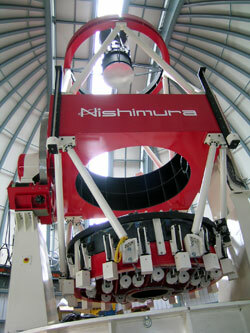 Following a grant from the Japanese government a 1.8-metre telescope was installed at Mt John in 2004. It will continue the microlensing work, watching many millions of stars for changes in brightness. In 2003 the MOA team discovered a Jupiter-size planet orbiting a star several thousand light-years away. As services to the local community the Observatory hosts Vodaphone cell-phone antennae and a FM repeater for National Radio. On a pillar near the summit is a GPS station run by the Institute of Geological and Nuclear Sciences and the Survey Department of Otago University. It is the base station for measuring bending of the South Island around the Alpine Fault. A webcam gives hourly updates of the region's weather. Earth & Sky, a Tekapo company, now runs daytime tours of the Observatory. In 2005 they plan to install a 40-cm telescope for public viewing in the '16-inch' dome. Since Mt John was established, the village of Lake Tekapo has grown, so increasing night sky brightness has become a concern. Mackenzie District Council ordinances require that all outside lights be full cut-off so that no light shines upward into the sky. The new subdivision developers are installing observatory-friendly, low-pressure sodium lighting.